Carlos Munoz at the Washington Times reports on the U.S. warships who launched cruise missiles at Syria. American warships stationed off the Syrian coastline fired a salvo of cruise missiles against a Syrian military base in the western part of the country, days after a regime chemical strike left nearly 100 civilians wounded or dead. Roughly 50 Tomahawk cruise missiles were fired as part of the attack early Friday morning, U.S. officials said. The strikes were centered on the al Shayrat airfield near the western Syrian city of Homs, located in the Alawite-dominated region of the country. 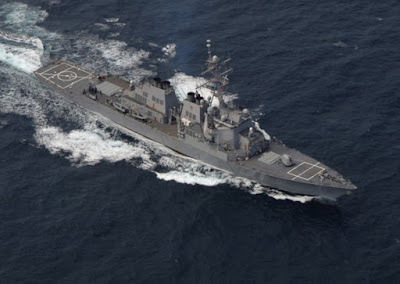 Note: The above U.S. Navy photo shows the USS Ross at sea. The USS Ross was one of the American warships that launched cruise missiles at Syria.